Anger over the recent terrorist attacks in France appears again to have been misdirected at a Denver book store. 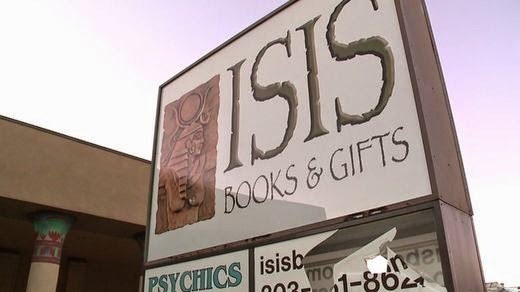 Isis Books & Gifts on South Broadway has been in business for 35 years, but lately it has been threatened and targeted by vandals associating it with the terrorist group commonly referred to as ISIS. This weekend, someone threw a brick through an “Isis Book & Gifts” sign outside the business. The incident took place just days after the ISIS terrorist group claimed responsibility for attacks in Paris. Karen Charboneau-Harrison, owner of Isis Books & Gifts, said she named her store after the Egyptian goddess Isis. Charboneau-Harrison said the goddess represents women, healing and magic, and she says it’s a fitting name for a store that features books and gifts from all types of world traditions and spiritual sources. The shelves include Christian, Hindu, Native American and Pagan texts, to name a few. “We believe that everybody is right when it comes to the way that they express their spirituality as long as it’s a positive path,” Charboneau-Harrison said. In recent months, the acronym ISIS, which stands for Islamic State of Iraq and Syria, has been associated with a terrorist organization that has carved a destructive path. After the attacks in Paris, Charboneau-Harrison said she was disappointed to see someone shatter her sign outside. Charboneau-Harrison said it is the fourth time the business has been vandalized in just the past few months. She said they had to replace their front door after someone shattered the glass. Someone also threw pink paint across the front of the store, and the same sign has already been broken once before. “It does get a bit tiresome,” Charboneau-Harrison said. “Plus expensive.” But instead of changing the store’s name, Charboneau-Harrison hopes everyone changes what they call the terrorists. President Barack Obama already uses the term ISIL. After the Paris attacks, support is also growing for using the term Daesh, which is an acronym for the groups full Arabic name (al-Dawla al-Islamiya fi al-Iraq wa al-Sham) and can also be interpreted as a play on words. “It apparently means a bigot who chooses to be violent, which describes them much better than using an Egyptian goddesses name,” Charboneau-Harrison said. In the meantime, if seeing the sign for her store makes people angry, Charboneau-Harrison has a suggestion. “They should come in and we can help them with meditation and we can explain to them how they can empower themselves instead of throwing rocks,” she said. Comment: Welcome to ‘Merica! A land where you can proudly express your violent tendencies with blatant stupidity!